** spoiler alert ** I might be slightly overrating this book, since while reading it I found myself thinking that this book had been deliberately crafted to emotionally wound me in the most brutal way possible. Norwegian Wood is a story about a university student's love life, which primarily centers around two girls - Naoko, a girl who was dating Watanbe's friend who abruptly killed himself; and Midori, a university classmate of his. A bunch of other things are happening in the background, but this is the primary struggle. Naoko is committed to a mental care facility to help her heal from the grief of her boyfriend killing himself, and Watanbe promises he will wait for her. As he grows closer to Midori, the question of exactly how long Watanbe is willing to wait for Naoko becomes the focus of the book, and eventually Naoko's death and Watanbe's subsequent grappling lead to the end of the story. 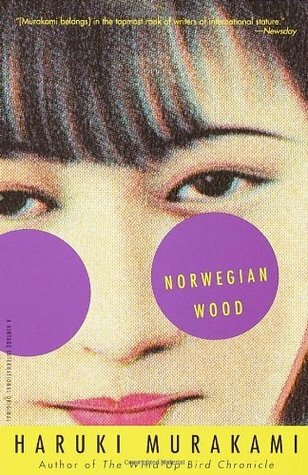 At it's core, Norwegian wood is a story about four things: loss, nostalgia, loneliness, and sexuality. These things blend together in Murakami's work in heartwrenching and confusing ways, and Murakami explores where these things overlap to the point where they are nearly indistinguishable at times. Throughout the book, characters lose things that were once precious to them, even things that they did not fully appreciate when they had them. The big things - Naoko, Katsumi, Midori's parents, Hatsumi - are only a microcosm of this. Throughout the work, everyone looks back upon things they once had but no longer do. Watanbe reflects fondly upon how much he misses Stormtrooper, someone who irritated him at the time but who affected his life so dramatically that he practices cleanliness wherever he goes. Reiko lost her family, and her career as a pianist. Naoko loses her sanity, and her sexuality. Over and over, loss rears its head in this story, which blends nicely into Murakami's use of nostalgia. Reiko loves music, and always has her guitar around. Watanbe thinks about the dorm head, and about playing pool with Katsumi, about "times gone forever, friends who had died or disappeared, feelings [he] would never feel again". This book doesn't mess around with it's bittersweet depiction of this nostalgic rumination, and indeed the book is written from the perspective of Watanbe obsessively reflecting upon his past, "clutching these faded, fading, imperfect memories to my breast... with all the desperate intensity of a starving man sucking on bones." Likewise, The Great Gatsby is a hugely important reference in the story and is explicitly beloved by Watanbe and his close friend Nagasawa. The obsession, the nostalgia, the wild, desperate passionate love for something that doesn't exist any longer, and the very symbolism of the Green Light are seemingly lifted straight from Fitzgerald's great novel and reappropriated here. "Long after the firefly had disappeared, the trail of its light remained inside me, its pale, faint glow hovering on and on in the thick darkness behind my eyelids like a lost soul. More than once I tried stretching my hand out in the dark. My fingers touched nothing. The faint glow remained, just beyond my grasp"
"I was always hungry for love. Just once, I wanted to know what it was like to get my fill of it - to be fed so much love that I couldn't take any more. Just once. But they never gave that to me. Never, not once." and this loneliness pulls no punches with it's alienating, almost underwater depiction. "I became aware of something. In his or her own way, everyone I saw before me looked happy. Whether they were really happy or just looked it, I couldn't tell. But they did look happy on this pleasant early afternoon in late September, and because of that I felt a kind of loneliness new to me, as if I were the only one here who was not truly part of the scene. Come to think of it, what scene had I been a part of in recent years?" The book frequently touches upon the intersection between Watanbe's sexuality, his nostalgic sexual encounters, and his current loneliness. This part of the story drags on, capturing the agony Watanbe feels trying to square away these three complicated emotions. What eventually transpires is Watanbe choosing Midori, "a real, live girl, with real, live blood gushing through [her] veins" rather than Naoko, who has become a mere idea to Watanbe and eventually kills herself, demonstrating the clash between the death of the past and the life in the present. It's gut-wrenching, and a little heavy handed, but it gets the point across. This is not a book I imagine everybody will like, but I think it was a phenomenal work which was very real in its portrayal of very unpleasant, melancholy feelings. I think in general if you liked The Great Gatsby you'll rather like this, as it's a similar story but replacing all of the rich people with promiscuous teens that are just as emotionally fragile. "What I learned from Naoko's death was this: no truth can cure the sadness we feel from losing a loved one. No truth, no sincerity, no strength, no kindness, can cure that sorrow. All we can do is see that sadness through to the end and learn something from it, but what we learn will be no help in facing the next sadness that comes to us without warning." Sign into Goodreads to see if any of your friends have read Norwegian Wood.